Hi guys! I'm back! I'll start off briefly with an apology for taking longer than I expected to be posting again. I've been writing this post up but then as I was about to post - bam - sickness bug. It's that time of year, isn't it? It hits autumn, kids go back to school and then everyone is catching everything. It leaves me longing for those happy and lazy summer evenings again, so it's only fitting that the products I'm going to be chatting about today make me think of just that. The Crabtree & Evelyn Pomegranate & Argan Oil Nutri-Oil and the Rosewater & Pink Peppercorn Soap are two of their newer products that I've been testing out whilst on break from posting. 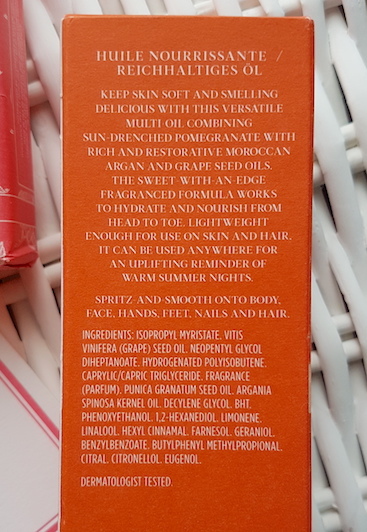 The Pomegranate & Argan Oil Nutri-Oil is one of those multi-tasking products that I love trying out. It can be used on the face, body or hair to moisturise, hydrate, soften and to add a beautiful scent to the skin and/or hair. It contains notes of pomegranate, orange, sweet fig, black pepper and ginger, so you could almost see this as a fragrance as well as a skincare product. 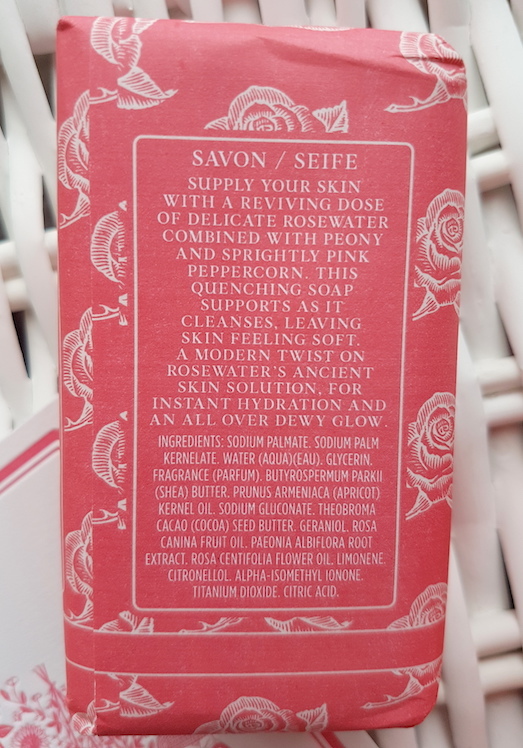 The Rosewater & Pink Peppercorn Soap is a naturally deodorising, vegetable-based soap bar that contains Shea Butter and Apricot Kernel Oil to hydrate and soften and rosewater, spicy peppercorn, patchouli and akigalawood to fragrance. I'll begin by looking more in depth at the Pomegranate & Argan Oil Nutri-Oil and then the Rosewater and Pink Peppercorn Soap. Info on where to purchase both of the items can be found at the end of the post. I've written about a number of multi-tasking oils - specifically argan oil - in the past. This one, however, is slightly different from those. Out of all the oils I have written about, I would say it is closest in product type to The Body Shop Beautifying Oils, but with one fantastic difference: the sprayer. This oil comes packaged in a glass bottle with a metal spray cap. This means there is no pouring out of the oil onto the hands to massage it into the skin, and instead you can spray it onto the body or hair with a light mist, applying more if necessary rather than applying too much and not being able to do anything about it. If you are a fan of the spray bottle Nuxe Huile Prodigieuse oil, then this is likely to be right up your street. As explained in the intro, this can be used in different ways. It can be used on the body, on the face or hair. However, as my hair goes greasy very easily and my skin is incredibly oily (even though oil on oily skin isn't necessarily a bad thing! ), I have been sticking to using this as a body oil and boy, do I love it. When using on the body, I find that it's best to use on damp skin straight out of the bath/shower. This means that the oil spreads easier over the skin and in turn you can use less product at a time. It also absorbs a little easier too. So straight out of the bath/shower you spray this on and massage in, and the first thing you will notice is that beeaaaautiful smell. And you know what? The smell lasts. For example, I have put this on before bed and I have woken up with the scent still going strong on my skin. This type of thing excites me because it opens up so many potentials for scent layering with your favourite perfumes, or it can even be used to fragrance the skin without the need for perfume if you prefer. Hydration wise, I find that this oil does a great job at keeping the skin soft and smooth with a subtle glow. If you prefer more of a glow on the skin, you can apply more oil to build it up, but if you prefer just a slight glow, you can do that too! If you have super dry skin you will likely be layering this with a stronger body lotion on top, or you can always apply extra oil throughout the day to keep the skin feeling moisturised. Another bonus with this oil is that is doesn't leave the skin feeling greasy. It absorbs quickly and you're left with no greasiness on the skin at all. Overall, I am adoring this oil. A serious amount. It's so easy to simply spray on post bath/shower, massage in and go. Not only that, but the scent is so easy to wear. It isn't heavy, it's inoffensive and, like Crabtree & Evelyn say on the packaging, it takes you back to those happy and lazy summer evenings. Perfect. 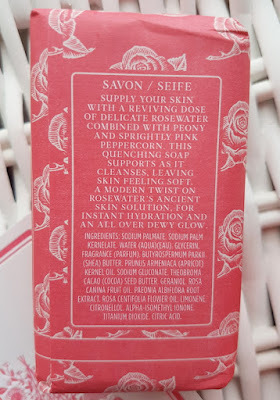 The Rosewater & Pink Peppercorn Soap is described by Crabtree & Evelyn as a hand soap, but to test it out I also used it as a body wash. I did this because the packaging states that it leaves the skin with a natural and dewy glow, but this seems like something you'd be more expecting to see on the body rather than the hands. Either way, it confused me a tad, so I went along with hey, soap is soap. Let's try both. 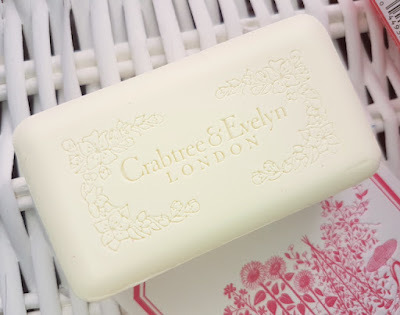 As with the oil, and all other Crabtree & Evelyn products, the first thing that you notice with this soap is the gorgeous fragrance that it carries. Actually, that was a lie. If it is the first time that you use it then the first thing you notice is that super pretty packaging. Just look how cute it is! Moving on though, this soap lathers up so easily, so you won't need to be using too much at a time with it. It spreads easily across the skin and leaves it feeling incredibly clean yet not dried out, which is good news if you suffer from dry skin. I find that it leaves the skin smelling nice for quite a while after use, so that makes it quite good to use as a bodywash if you want to. Crabtree & Evelyn actually recommend using this as part of a three-step hand care routine, beginning with their Hand Recovery scrub to exfoliate the hands, then the soap, and then follow it up with some of their Hand Therapy cream to moisturise. I have previously reviewed their La Source Hand Recovery and Hand Therapy products, so I tried out this routine myself. The three-step routine does indeed leave your hands feeling possibly the softest they have ever felt, so I really do recommend trying it out if you like to keep your hands feeling soft and smooth. Overall, I do like this soap. It leaves the skin feeling clean and nicely fragranced without leaving it dry after use, and that is the most important thing when trying out any new bar of soap in my opinion. 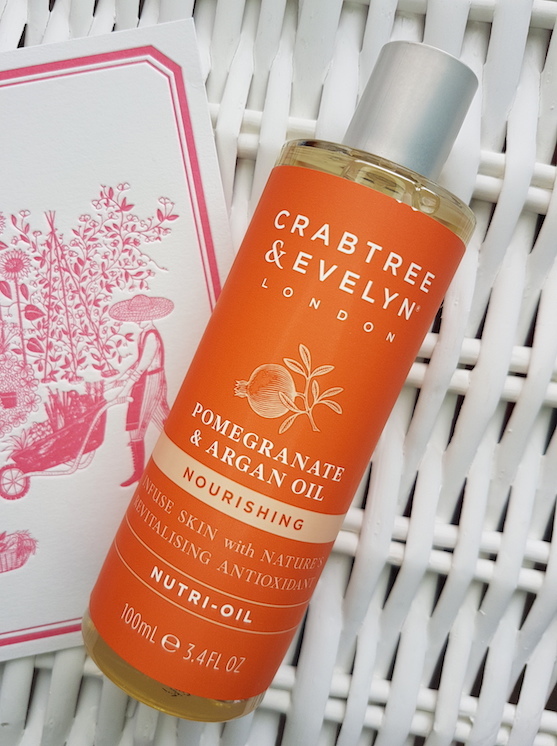 It ticks the boxes and it works great as part of the three-step routine with other Crabtree & Evelyn products. I think that they're both great new additions to the Crabtree family of products, and out of the two I would highly recommend checking out the Pomegranate & Argan Oil Nutri-Oil. I am seriously in love with it! You can purchase both products from Crabtree & Evelyn. 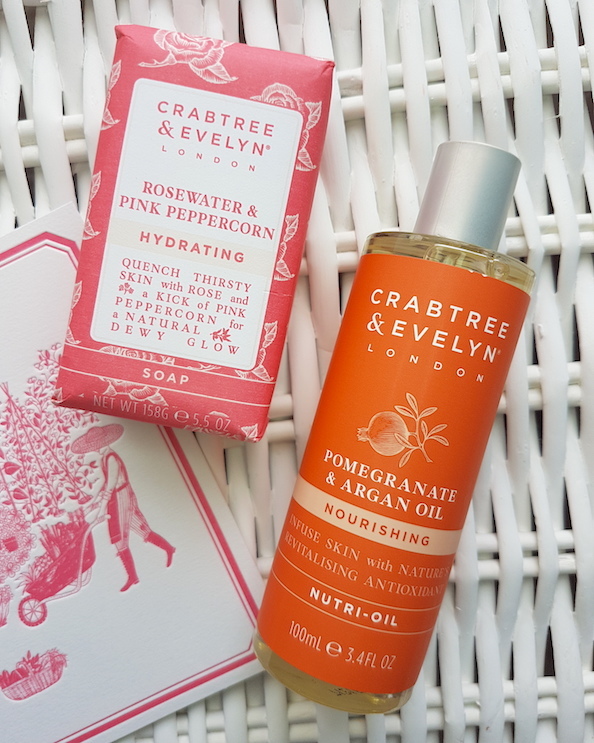 What are your thoughts on the Crabtree & Evelyn Pomegranate & Argan Oil Nutri-Oil and Rosewater & Pink Peppercorn Soap? 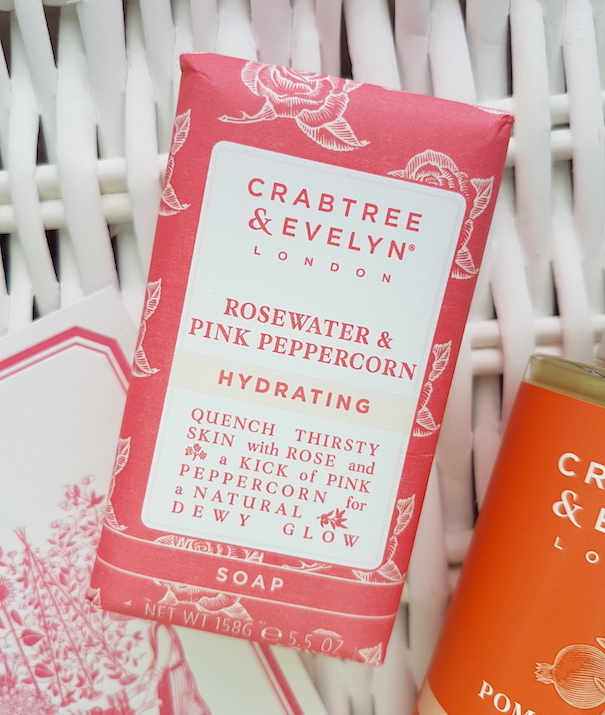 What Crabtree & Evelyn product is your fave? I have tried the soap and have been using it for last few months. The best part of the soap is the beautiful scent and the beautiful effect it leaves to the body.